BACKGROUND: In a previous Swedish study it was shown that it is possible to predict which chiropractic patients with persistent LBP will not report definite improvement early in the course of treatment, namely those with LBP for altogether at least 30 days in the past year, who had leg pain, and who did not report definite general improvement by the second treatment. The objectives of this study were to investigate if the predictive value of this set of variables could be reproduced among chiropractic patients in Finland, and if the model could be improved by adding some new potential predictor variables. METHODS: The study was a multi-centre prospective outcome study with internal control groups, carried out in private chiropractic practices in Finland. Chiropractors collected data at the 1st, 2nd and 4th visits using standardized questionnaires on new patients with LBP and/or radiating leg pain. Status at base-line was identified in relation to pain and disability, at the 2nd visit in relation to disability, and "definitely better" at the 4th visit in relation to a global assessment. The Swedish questionnaire was used including three new questions on general health, pain in other parts of the spine, and body mass index. RESULTS: The Swedish model was reproduced in this study sample. An alternative model including leg pain (yes/no), improvement at 2nd visit (yes/no) and BMI (underweight/normal/overweight or obese) was also identified with similar predictive values. Common throughout the testing of various models was that improvement at the 2nd visit had an odds ratio of approximately 5. Additional analyses revealed a dose-response in that 84% of those patients who fulfilled none of these (bad) criteria were classified as "definitely better" at the 4th visit, vs. 75%, 60% and 34% of those who fulfilled 1, 2 or all 3 of the criteria, respectively. CONCLUSION: When treating patients with LBP, at the first visits, the treatment strategy should be different for overweight/obese patients with leg pain as it should be for all patients who fail to improve by the 2nd visit. The number of predictors is also important. Chiropractors in the Nordic countries use predominantly spinal manipulative therapy (SMT) in their treatment of back problems, frequently in combination with soft tissue therapy, advice on exercise, ergonomic precautions, and lifestyle changes [3-5]. Randomized controlled clinical trials have shown that SMT has a positive effect on LBP . However, overall, the magnitude of the effect seems to be relatively small. Those, who believe that back pain consists of several specific but (as yet) undefined subgroups, obviously think that the recognition of these would improve the quality of care and that the selection of homogeneous study populations in etiological studies and clinical trials would improve the quality of research. Until recently it has not been documented which patients with LBP are most likely to benefit from the chiropractic approach. However, the predictive value of a set of clinical observations has been previously studied in patients with LBP receiving chiropractic care [7-10]. This research, conducted in Norway and Sweden under the Nordic Back Pain Subpopulation Program, has been running over the past years, in which specific subgroups of patients with LBP are systematically studied. For instance, it was shown that it is possible to predict which chiropractic patients with persistent LBP will not report definite improvement early in the course of treatment, making it possible to exclude from treatment those who are unlikely to become LBP-free. Information for the study was collected by the chiropractors on the first, second, and fourth visits [ Additional files 1, 2, 3]. For patients whose treatments were completed before the fourth visit, the last information was provided at the time of the final treatment. The whole collection period took place between the months of March and August 2005. Intervention was chiropractic management as decided by the treating chiropractor. All potential predictors but three were taken from the previous Swedish study , consisting of the base-line variables plus information obtained at the return visit in relation to whether there was at least one reported item of improvement as compared to at base-line in relation to pain when turning in bed, sleeping, putting on socks/shoes, walking, or getting up from sitting. This new variable was named better at 2nd visit. 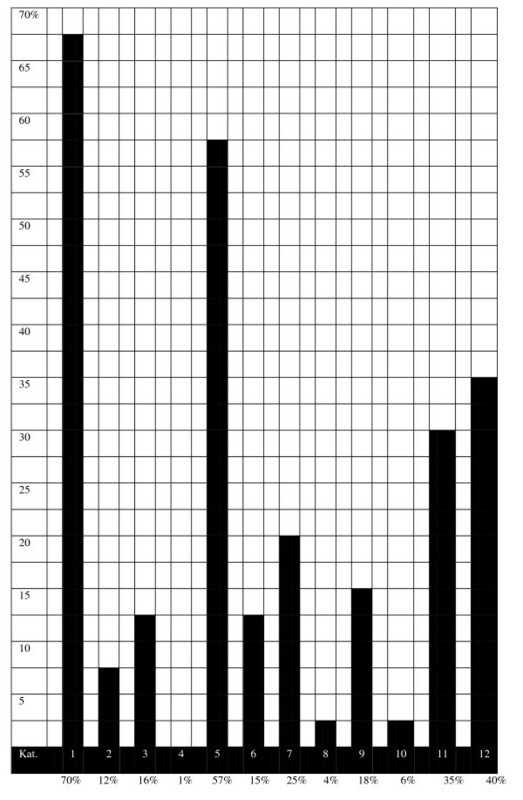 Another new variable (number of disabilities) was created by counting the number of positive answers to these questions (pain when turning in bed, etc.). Three new items: BMI, general health, and pain in other parts of the spine, were also included in the questionnaire. Two sets of multivariate analyses were carried out (logistic regression). In the first, we used the same variables as those found to be significant in the previous Swedish study, to see if their results could be reproduced in the present study sample. These variables were leg pain, duration of pain in the past year and improvement at the 2nd visit. In the second analysis, all the potential predictors used in the present study, shown to be significantly associated with the outcome variable, were entered into a logistic regression. Non-significant variables were removed until only significant variables remained. Because of the relatively large study sample, the significance level was set at p = 0.05 for allowing the variable to enter the model. In the second analysis, the three additional variables were also taken into account BMI, pain in other parts of the spine, and general health. Figure 1: The prevalence of 12 different subgroups of LBP in Finnish chiropractic patients. The subgroups are ordered from the most benign to the more severe to add up to 100% (n = 977). 12 – baseline > 2 weeks, persistent, daily. • "base-line" refers to the duration of pain at the first visit. • "non-persistent" = altogether < 30 days in the past year. • "persistent" = altogether at least 30 days in the past year. • "intermittent" and "daily" refers to the pain pattern at the first visit. The following variables were positively associated with definite improvement at the 4th visit: Leg pain, duration of pain at base-line, total duration of pain in the past year, general health, other spinal pain in the past year, BMI, immediate improvement and better at the 2nd visit. As can be seen in Table 5, the original "best" Swedish model, consisting of the three variables leg pain, duration of pain in the past year, and better at the 2nd visit, when tested on our data obtained a sensitivity of 41%, a specificity of 87%, and numbers correctly classified were 71.5%. The area under the Receiver Operator Characteristic curve was 72%. The final minimal model, based on the variables previously used in the Swedish study, consisted of only one variable, better at 2nd visit. 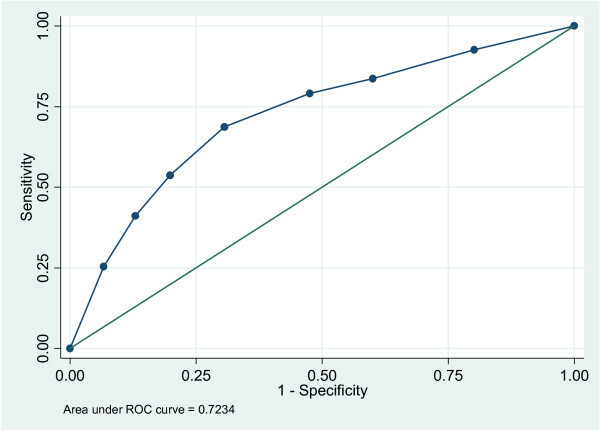 It had a somewhat higher sensitivity and lower specificity but there was almost no change in the number classified and area under Receiver Operator Characteristic curve [Figure 2]. Figure 2: The Receiver Operator Characteristic curve. consisted of only one variable, better at 2nd visit. The three new variables, BMI, general health, and spinal pain, were added to the full model as described above [Table 6]. Again the estimates of clinical significance changed somewhat, but the presence of these extra three factors did not really improve the model. BMI was retained in the final model together with leg pain and better at 2nd visit. In all models, better at the 2nd visit in relation to outcome had the strongest odds ratio with estimates between 4.7 and 5.0. For detailed information, see Table ?Table6.6. In the clinical situation, this means that 80% of patients with LBP with or without radiating leg pain, who report to be better at the second visit, are definitely improved by the 4th visit, whereas this is the case only for 50% of those who are not better by the second visit. Finally, a logistic regression was undertaken in which the 3 variables that remained in the final model (leg pain, not better at 2nd visit, and overweight/obese) were checked for a dose-response, in relation to being definitely improved at the 4th visit. With none of these findings, 84% would be definitely better at the 4th visit, whereas the corresponding figures for one, two, respectively three of these findings were 75%, 60% and 34%. The data have been presented also as odds ratios in Table 7. Additional file 1: Baseline questionnaire for Finnish predictor study (pdf). Finnish distributed questionnaire followed by an English translation. Additional file 2: Return questionnaire for Finish predictor study (pdf). Finnish distributed questionnaire followed by an English translation. Additional file 3: 4th visit questionnaire for Finnish predictor study (pdf). Finnish distributed questionnaire followed by an English translation. Searching for a conceptual framework for nonspecific low back pain. Leboeuf-Yde C, Axén I, Ahlefeldt G, Lidefelt P, Rosenbaum A, Thurnherr T.
The types and frequencies of improved non-musculoskeletal symptoms reported after chiropractic spinal manipulative therapy. Chiropractors in Finland – a demographic survey. Leboeuf-Yde C, Grønstvedt A, Borge JA, Lothe J, Magnesen E, Nilsson O, Røsok G, Stig LC, Larsen K.
Axén I, Rosenbaum A, Robech R, Larsen K, Leboeuf-Yde C.
Side-effects of chiropractic treatment: a prospective study. Cole TJ, Bellizzi MC, Flegal KM, Dietz WH. Establishing a standard definition for child overweight and obesity: worldwide international survey.